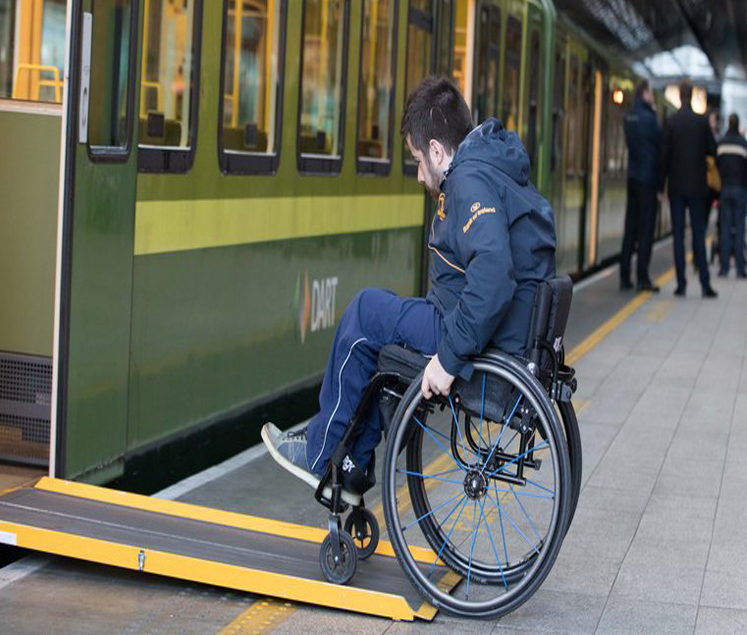 Irish Rail have today published the first review of a new pilot project (DART Improved Accessibility Pilot) aimed at making the DART more accessible for disabled passengers. The “Dart Accessible Pilot Review – April 2018” found that between the period of January 29th to February 25th there were 2,148 accessibilty users assisted. It was found that Dublin Connolly DART station offered the most assistance with the number of assists totalling 554. There were also 13 calls received from accessibility users that requested assistance but did not turn up at the station, while three assists did not go through successfully at Connolly station. “This was down to phone calls not being received from the origin station who were caught dealing with other Customer issues and never made the phone call to Connolly,” said a spokesperson for Irish Rail. The requirement of 24 hour advanced notice is viewed as being outdated, impractical and an obvious sign of inequality. Less frequent and older passengers of the DART service are most likely to contact the call centre to arrange assistance. More frequent and younger passengers have developed tactics which have become habitualised, one example is personal staff mobile numbers have been attained with strong relationships between Disability user and staff member. Stick to travelling via Dart during the times when they know someone will be at the station to help. Communication is one of the main factors impacting upon the efficiency of the assistance programme. When all parties; control, station operatives (at boarding and departing stations) and drivers, are fully aware of a passenger boarding and departing stations the service works well. The DART Improved Accessibilty Pilot went live on January 29th in order to provide better service and quicker response times for DART accessibility users. It is currently on an initial six month trial basis. Before this project was implemented, disabled passengers using Irish Rail services were required to give 24 hours’ in advance notice to Irish Rail to ensure there would be suitable supports at the ready for their journeys. The pilot reduces 24 hours’ notice to four hours. “I am very aware of the difficulties faced by people with disabilities who use public transport. In January I welcomed the introduction of the DART pilot project which involved reducing the notice period for assistance with travel from 24 hours to 4 hours. “It is obvious to me that, as we try to improve services in public transport for people with disabilities, the most appropriate expert voice that needs to be heard is their own. The publication of the DART project report gives me the opportunity to highlight that the closing date for applications to the Boards of the National Transport Authority, Irish Rail, Bus Éireann and Dublin Bus has been extended by one week to 27th April. For further information on the review you can visit www.irishrail.ie.